AWstats is a popular server log analyzer included with cPanel. It can be used to generate a wide variety of traffic reports allowing you to understand who is visiting your website, when they are visiting and which pages they visit the most. 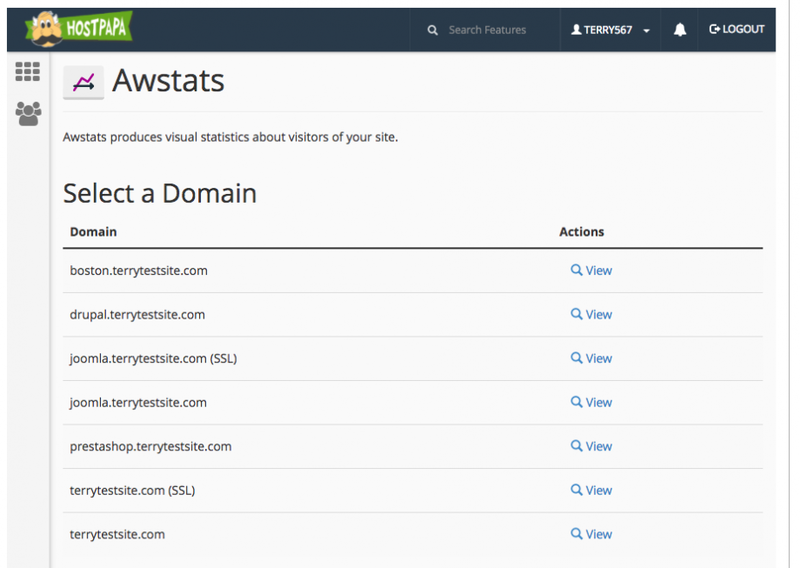 AWstats is available from your cPanel dashboard. Log in to cPanel. Scroll down to the Metrics section and select the AWstats icon to proceed. You’ll be presented with a list of your domains and subdomains. Click the View button to open the report for each domain. You’ll see stats for both Viewed and Not viewed traffic. The latter includes traffic generated by robots, worms, or replies with special HTTP status codes. Statistics are updated on a daily basis – you can see the date and time of the latest update at the top of the page. By default, you’ll be presented with a report for the current month. Use the dropdown menu at the top of the page to view the report for previous months. Locales – a full list of visitor countries, ranked by page impressions, with hits and bandwidth metrics. Hosts – a report showing full details of visitor IP addresses, with date stamps, page impressions, hits and bandwidth. Authenticated users – users who have logged in to a password protected area of your site. Robot/Spiders visitors – a list of web crawling robots that have visited the site, commonly used by Google, Yahoo, Bing and other service providers. Downloads – a full list of files that have been downloaded on your site. Viewed – a full list of URLs visited by website users. Metrics include page impressions (viewed), the average page size (in kilobytes or megabytes), and entry/exit statistics (useful for identifying your most common landing pages or exit URLs). Operating Systems – detailed statistics on the operating systems being run by devices used to visit your website (handy for identifying mobile and desktop traffic). Referrers – search engines and websites that link to your content and send traffic to your website. Search – a full list of search phrases and keywords used to identify and link to content on your website. This analysis is useful to understand what your users are seeking when visiting your website and can support a strong SEO (search engine optimization) strategy. Errors – a list of pages that are currently generating errors when visited. Identifying and resolving these errors promotes a better user experience and will improve your standing with search engines.